Comprised of seven thematic galleries that portray the cultural, historical and religious heritage of the Jewish people, the Cincinnati Skirball Museum has a long history as one of the oldest repositories of Jewish cultural artifacts in America, according to its website. The seeds for the museum began when Hebrew Union College (HUC), founded by Rabbi Isaac Mayer Wise in 1875, began accepting donations of Judaic objects and books. By 1990, the Skirball opened its doors in the renovated Mayerson Hall on HUC’s campus. Director Abby S. Schwartz views her role at the museum as a culmination of her love of art and Judaica. A 1975 graduate of the University of Rochester with a major in history and minor in history of art, Schwartz went on to obtain her master of arts in art history at the University of Cincinnati in 1993. To this day, she uses both degrees. Schwartz’s interest in art history began at an early age when her father Meyer Scher, an attorney and son of a rabbi, introduced her to history and interpretation. Her high school art teacher introduced her to primary source documents. This education exposed her to a way of looking at the world from a humanities and cultural perspective. “I am a visual person,” said Schwartz, who spread her wings from northern New Jersey to upstate New York and ultimately to Cincinnati, working at the Taft Museum of Art as curator of education from 1990 to 2007 and landing now as director of the Skirball. Married to David Schwartz, M.D., Abby first taught in Ann Arbor. Moving to Cincinnati for Dr. Schwartz to complete his education, Abby thought the couple would move back East, where she grew up. But, they decided to stay (36 years), raised a family in Wyoming, which includes daughter Amy and son Jason, and established solid careers. With a two-month old in tow, Schwartz saw an ad for the docent program at the Taft in The American Israelite, applied and was accepted. She stayed as a docent volunteer for eight years. Taft museum director at the time, Ruth Meyer, offered her an internship opportunity for six months. Schwartz accepted and found the Taft the best kept secret in town. Meyer wanted to make it more accessible. When Schwartz first started, she helped staff with projects in a number of departments. By 1988 she became acting curator of education, a position where she could raise her family and work part-time. Because she noticed a silo effect in the museum world, Schwartz worked with other curators in the city to collaborate, which both Meyer and her successor Phillip Long encouraged. At the Taft, she participated in outreach programs, such as Artists Reaching Classrooms and Search for the Spiritual Through Art, a lecture series about Judaism, Islam and Christianity. Schwartz also taught Taft docents, who required one to two years of training using such contemporary methods as Visual Thinking Strategies. With a small staff and a collection of 700 objects, she interacted regularly with the directors and curators and found herself wearing many hats. She found former curator/deputy director David T. Johnson, now deceased, and current chief curator Dr. Lynne Ambrosini, influential in making education a part of the museum experience. Technology has had an enormous influence on the art world, as with others. In an exhibition opening at the Skirball in June titled Jewish Life in Germany Today, presented in collaboration with the American Jewish Committee, the German Consulate, and the Jewish Community Relations Council, visitors will be able to use a QR (Quick Response) code on their smart phone to gather information about the work. “While we embrace it, at the same time we are bombarded with technology,” said Schwartz, who cited the need to balance it with engaging people person to person. “Museums in general are faced with competition for leisure time,” she said. With both parents often working, museums are creating family friendly events as opposed to activities in a staid ivy-covered environment. In 1990, Schwartz assumed the role of curator of education at the Taft, where she remained until her retirement in 2007. Although she found it a demanding job, Schwartz spent seventeen years there and left on a high note. She contributed to the renovation of the Taft and didn’t burn a bridge. “Taft will always be in my heart,” she said. Schwartz took a year to coast and didn’t sign onto anything major. She became active with the Jewish Federation and served on the executive committee of the Skirball as well as the admissions committee for HUC’s rabbinical program. Following an extended period of staff turnover, the current dean of HUC’s Cincinnati campus, Rabbi Jonathan Cohen, was passionate about returning the museum to its former glory. Cohen approached Schwartz about assuming the interim director position. With a strong network in the Jewish community and a solid art background, Schwartz said, “This was the right time. Either I knew what to do or whom to ask.” With a lot of contacts in the art world as well, Schwartz was ready. Although Schwartz now works part-time three days a week, she is often involved in weekend and evening events. But she makes time to see her children who live out-of-town and her 99-year-old mother. Her administrative and educational training has served her well in a variety of community roles, including chairing the instruction committee at the Art Academy of Cincinnati as well as serving on its board. Schwartz also contributed to efforts to create opportunities for the Academy board to see what was happening in the classrooms. Reaching out to other organizations since beginning at the Skirball about a year ago, Schwartz has recently collaborated with the University of Cincinnati’s Osher Lifelong Learning Institute (OLLI), the Jewish Federation, and UC’s DAAP on programming and exhibition initiatives. On tap in the coming months are collaborations with FotoFocus and Cedar Village Retirement Community. Entering the Cincinnati Skirball Museum, one is immediately struck by an exhibit depicting a number of American Jews who have made significant contributions to society. Seven sections of the museum highlight 4,000 years of Jewish life and culture, focusing on immigration, the American Experience, archaeology, the Torah, Jewish festivals and life cycles, the Holocaust and Israel. There are over 1,000 artifacts and works of art forming the core exhibition. 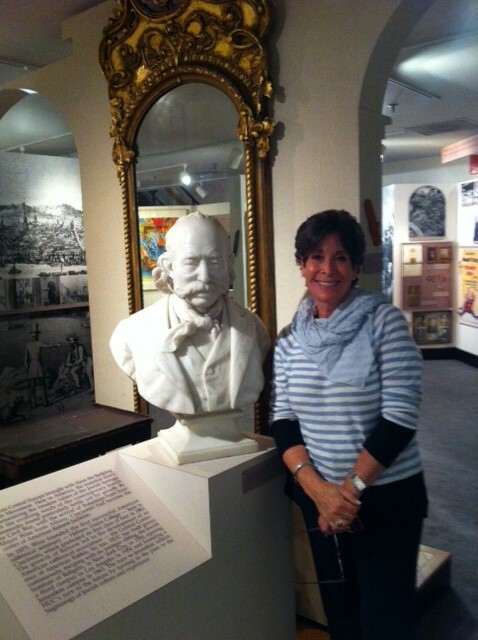 Highlights of the museum include a bust of Rabbi Isaac Mayer Wise, founder of HUC, (1819 – 1900), sculpted by renowned artist Moses Jacob Ezekiel (1844-1917), who was the subject of a recent exhibit at the Skirball. 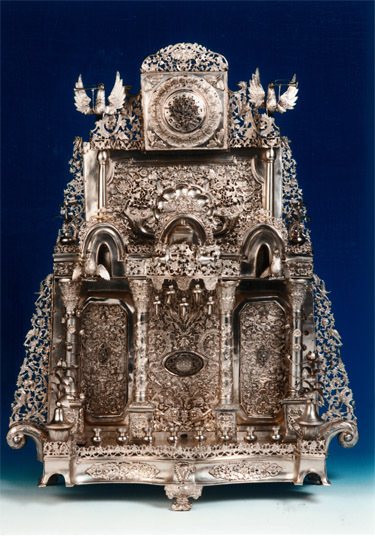 Another gem is an elaborate Hanukkiyah (Hanukkah lamp) crafted of silver applique in central Europe, early 19th century. 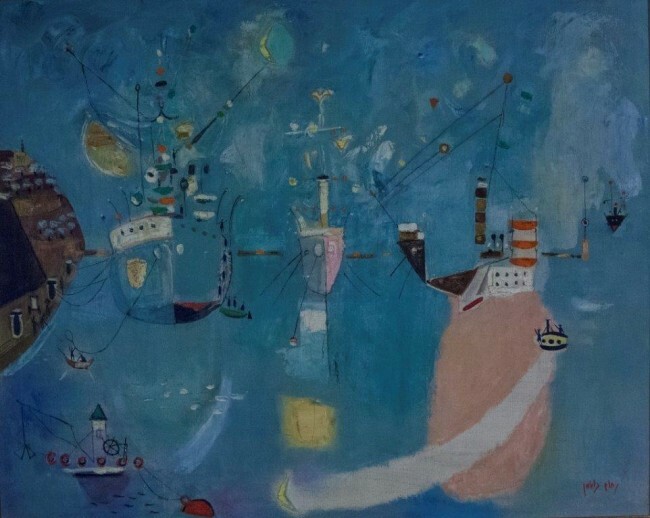 In addition, there is a painting entitled Haifa Harbor, oil on canvas,1960, by renowned Israeli artist, Nachum Gutman (1898-1980). Each May, Jewish Americans celebrate Jewish American Heritage Month, which focuses on the contributions American Jews have made to the fabric of American history, culture and society. The Skirball’s object of the month, featured on its website, is a Rookwood Genesis Plaque, commissioned by The Procter & Gamble Company in 1954 for the cornerstone of its new building on Fifth Street. Hebrew Union College-Jewish Institute of Religion President Nelson Glueck (1900 – 1971) suggested that an inscription be translated into all modern and classical languages and engraved on a clay tablet – a modern day Rosetta stone. The first line of Genesis was chosen as the inscription: “In the beginning God created the heaven and the earth.” Founded in 1880 in Cincinnati, the Rookwood Pottery Company made the plaque inscribed by potter Earl Menzel (1882-1971).